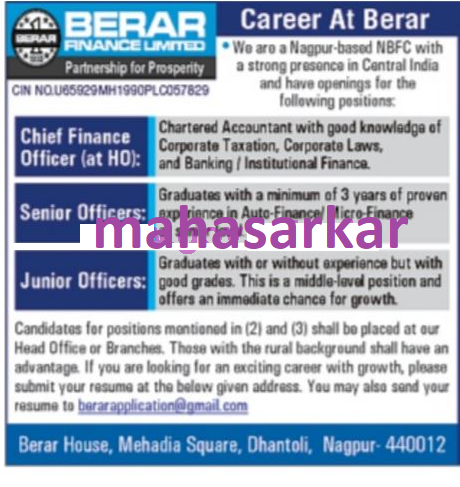 Berar Finance Nagpur (Berar Finance Limited), Nagpur published a new job notification for Chief Finance Officer, Senior Officer, Junior Officers Posts. The willing candidates are informed to see the latest notification March 2019. Qualification required Chartered Accountant with good knowledge/Graduate and More. For More details of Berar Finance Nagpur Recruitment 2019 Read Below. Education Qualification: Chartered Accountant with good knowledge/Graduate and More. For Post wise Education Details follow the detailed advertisement. Interested & Eligible candidates can send their application along with all the necessary documents and testimonials Email to berarapplication@gamil.com. Application starts online 16-03-2019. Last Date of application: As soon as possible.